If you love apple pie but don't like the fat that's often in apple pie, don't worry. 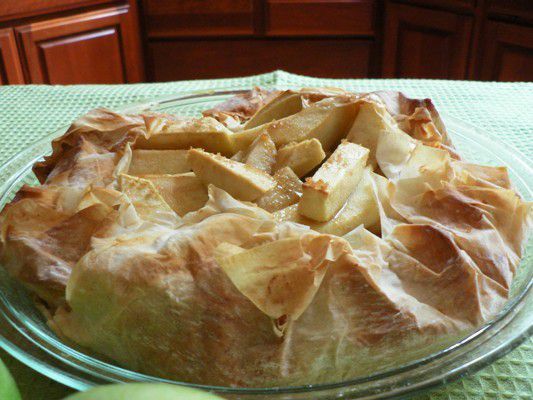 Keep apple pie on the menu this year with this low-fat galette-style apple phyllo pie. This recipe works well with Granny Smith apples, but there are plenty of other apple options, such as Braeburn, Pink Lady, and Jonagold. This twist on apple pie is easy enough for a weeknight dessert craving but tasty enough to serve at a dinner party or even Thanksgiving. And don't worry if there is also apple pie on the Thanksgiving dessert table, this galette is different enough from a pie that your diners can enjoy both. Brushing the sheets of phyllo dough with a mix of honey and warm water rather than melted butter keeps the fat content in check. You could also use butter-flavored cooking spray instead. You'll want to slice the apples very thin and keep them a consistent shape. Another option is to add finely chopped walnuts to the apple mixture. They will add some protein and crunch to the mixture. For a fancier presentation, sprinkle some powdered sugar over the top of the galette right before serving. This makes for a party-worthy dessert. Serve this pie on its own or with vanilla ice cream, frozen yogurt, or whipped cream. If you have any leftovers, it's probably easiest to keep the galette in the pie plate, cover it with plastic wrap, and store it in the fridge for a day or two. Leftovers might end up a bit soggy, but they will still taste good and can be enjoyed cold or warm. Coat a 9-inch pie plate with nonstick cooking spray. Peel, core, and slice apples thinly. Combine apples, sugar, cinnamon, nutmeg, lemon, and flour in a large bowl and set aside. In a small pitcher or bowl, mix honey with warm water. Stack six phyllo sheets on a clean surface. Working quickly, brush the top sheet with the honey mixture and lay on the pie plate. Push the dough into the plate, leaving the sides overhanging. Brush the next sheet and lay on top of the first sheet. Brush the third layer and lay it so that the sides overhang the opposite side of the plate, making a cross shape. Do the same with the fourth sheet. Brush the fifth sheet with honey and lay it at an angle to the other sheets, and lay the sixth sheet at the opposite angle to the fifth. Spoon apple mixture into the pie plate, forming a large mound. Gather overhanging sides of phyllo sheets up to form a galette-style pie (where some of the fruit remains exposed in the center). Place in the oven and Bake for 30 to 35 minutes. Serves 6 to 8.